The squeeze to enter the Vancouver Real Estate market has reached a pinnacle. Condo sales are booming and prices are hitting higher highs every month. A mentality of ‘get in at all costs’ has allowed Canadians to accumulate private debt faster than any other advanced economy. This euphoric rush has pushed entry level condos skyrocketing. As you’ll see below, the fastest price acceleration is occurring in studio condo units. Studio condos have increased 24% so far in 2017, faster than any other segment. As you’ll notice, studio condo prices were relatively flat from 2010-2014 before exploding higher beginning in 2015. Since then they have soared from $636/ square foot to $979/ square foot. Good for a 54% jump in two years. 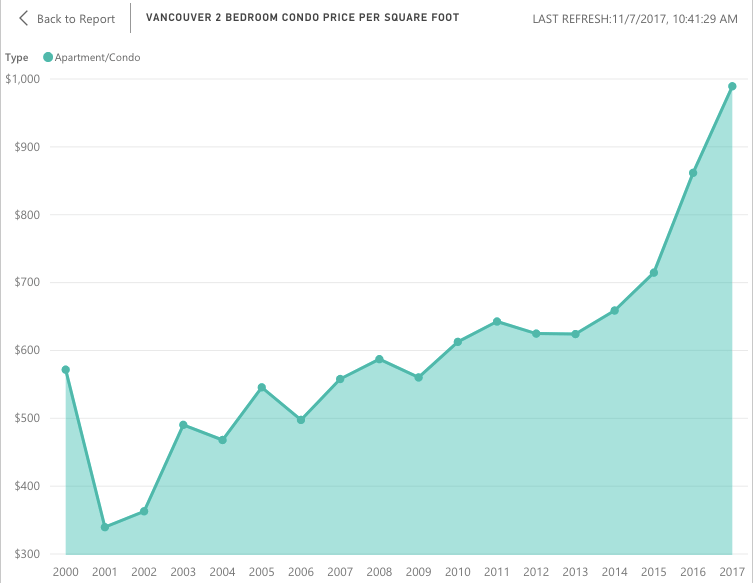 For context, 2 bedroom condo prices have risen 38% since 2015. 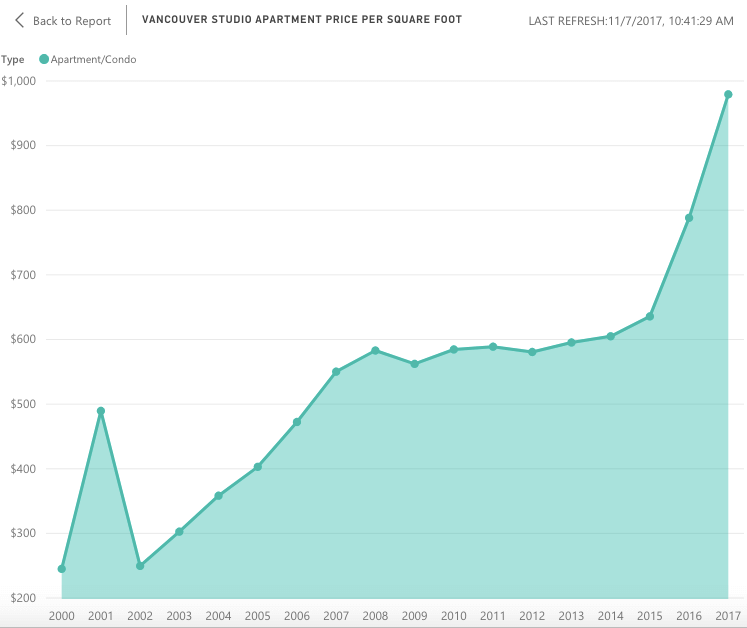 While that’s still a ridiculous increase it pales in comparison to studio condo units. It’s an interesting phenomenon when you think about it, you’re actually paying less per square foot for more condo. In other words, the bigger the condo, the better the value. 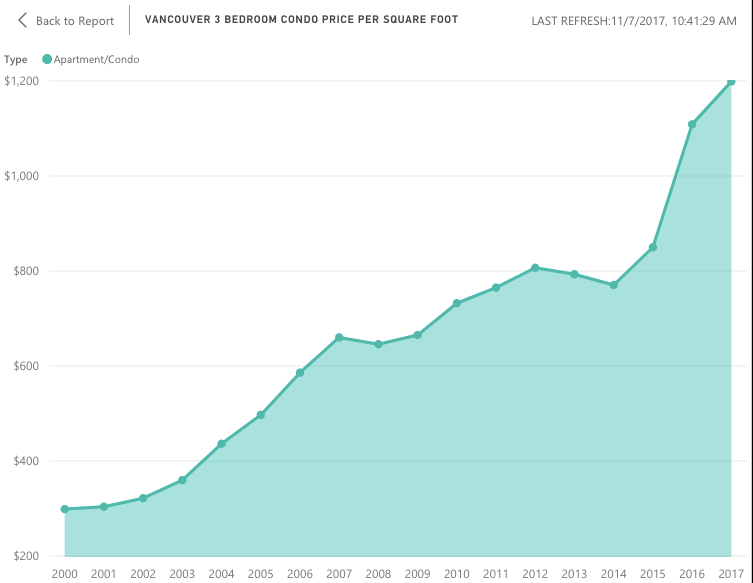 The average price per square foot for a 3 bedroom condo has increased by just 8% this year. Still a solid return but obviously not even close to the 24% for a tiny studio condo. This helps to highlight just who is buying and where prices are being driven up. There seems to be a lot of emotional buyers at the entry level. 3 Bedroom Condos in Vancouver Increase 8% in 2017.